Come for the desk, stay for the community! Our building is a converted two story home. We have about twenty full-time desks in our building along with a kitchen, bookable boardroom that can host eight people comfortably, and some side rooms for private phone calls etc. We have real fiber internet in the building, wired and wireless access throughout. Our members each have their own desk where they can leave a monitor, computer etc. They have 24/7 access to the building to use the space as they need. You also get access to our online Slack community where our current, and former, members collaborate. Coffee, parking, internet is all included. 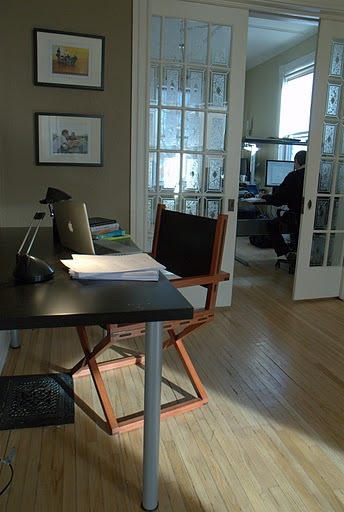 A full time desk in our space costs only $349 per month, with no long term lease. Our space is a communal and participatory space. It’s more of a private clubhouse than a busy public office. While it’s not a requirement, our members support each other and collaborate together. We even have members who have started new ventures together. We work in a mixture of fields from software to web design, environmental consultants and lawyers. Outside of our full-time desks, we also host public coworking days a few times per month. This is a great way to check out our space and get out of the coffee shop.